What is tough guy Kim Yong-Chol’s game and what happened in China on his way to NY? It does look like Singapore is on again. You can’t have so many emissaries going back and forth, between Pyongyang and New York, between Washington and Singapore, between Pyongyang and Singapore, between Manila and Panmunjeom, without thinking these guys are serious, something’s up. What, between Manila and Panmunjeom? What’s that all about? Oh yes, Sung Kim, remember him? He was U.S. ambassador to Korea for three years during the Obama administration, and before that, he was the chief negotiator responsible for dealing with the North Koreans. Tough job. It need hardly be said he got nowhere. In fact, between 2006 and last September, they conducted six nuclear tests. 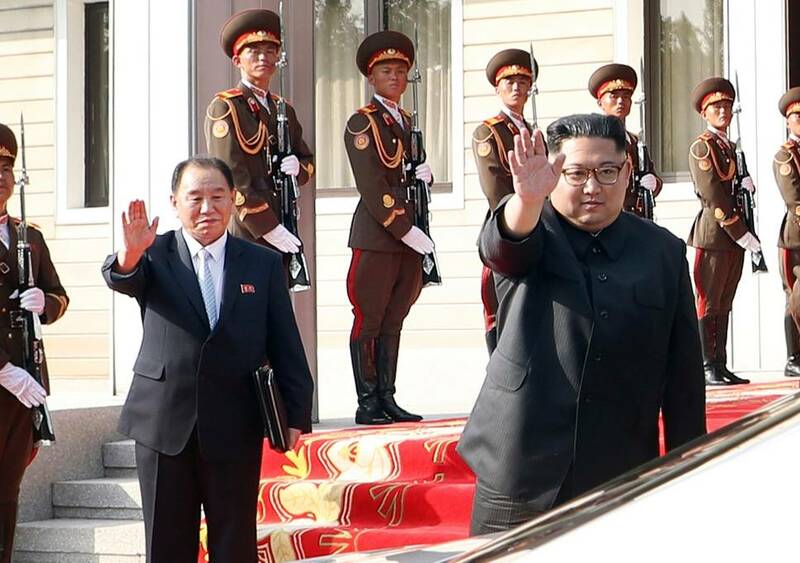 North Korea’s Kim Yong-Chol, left, and Kim Jong-Un. Sung Kim has got to know all about confronting the North Koreans. He’s faced not only vice foreign minister Kim Kye-Gwan but also assistant foreign minister Choe Son-Hui. Those were the authors of the nasty statements that got Trump so riled up that he cancelled the Singapore summit last week. Then, a day later, he thanked Kim Kye-Gwan for his “gracious” note in which Kim practically begged him to go through with the summit. But what’s Sung Kim got to do with all that? He was ambassador to the Philippines, trying to deal with another problem, that of the anti-American rants of the Philippine president, Rodrigo Duterte, when he got the summons to fly to Seoul and then go up to Panmunjeom. It was as if an old pro were suddenly called in to show what he could do when all else failed. It was an admission that the State Department does not have that many, if any, senior diplomats knowledgeable enough to deal with the North Koreans since the recent retirement of Joseph Yun, the last person to serve as the negotiator on North Korea. Sung Kim had a job to do, namely to talk to the same Choe Son-Hui, whom he had last seen in the old days of up-and-down, ultimately useless talks with the North Koreans before Obama sent him off to South Korea as ambassador. From Manila he had to make it to the truce village of Panmunjeom, where President Moon Jae-in and Kim Jong-Un had met the day before, and explain just what Trump meant when he talked about CVID, complete, verifiable, irreversible denuclearization. Of course, Choe knew all about CVID. She just wasn’t buying it. Who would expect her to say, Oh yes, we see what you mean. A sign that Sung Kim, the veteran negotiator, was really getting nowhere at Panmunjeom, aside from the fact that the North Koreans were reluctant to go on talking to him after that first conversation between him and Choe, was their decision to send Kim Yong-Chol off to New York to talk to the Americans, presumably Secretary of State Mike Pompeo. On the way, of course, he had to stop off in Beijing and pay obeisance to the Chinese or at least tell them what he planned to do and say in the U.S.
It’s unlikely Kim Yong-Chol’s mission is to tell the Americans, “We finally see what you mean about CVID and we’re willing to do it.” There was good reason to be highly suspicious of him. Remember, he’s believed to have been the man who ordered the torpedoing in 2010 of the South Korean navy corvette the Cheonan with a loss of the lives of 46 sailors. He’s viewed as a tough guy in no mood for compromise. In fact, compromise isn’t in the playbook of the North Koreans. Kim Jong-Un is making a show of friendship with Moon Jae-In while drawing Trump into talks that can only leave Trump looking bad. Suppose Trump says, nice meeting you but we simply have to get you to agree to CVID? As Sung Kim should have learned, yet again, that’s one compromise the North Koreans aren’t going to make. Donald Kirk has been covering the furor over North Korea’s nuclear program since writing about the 1992 agreement to create a “nuclear free” Korean Peninsula.